China's Xi Jinping Defends Globalization In First-Ever Speech At Davos : The Two-Way "No one will emerge as a winner in a trade war," the Chinese president said in Davos, Switzerland. He responded to statements by U.S. President-elect Donald Trump, without mentioning his name. 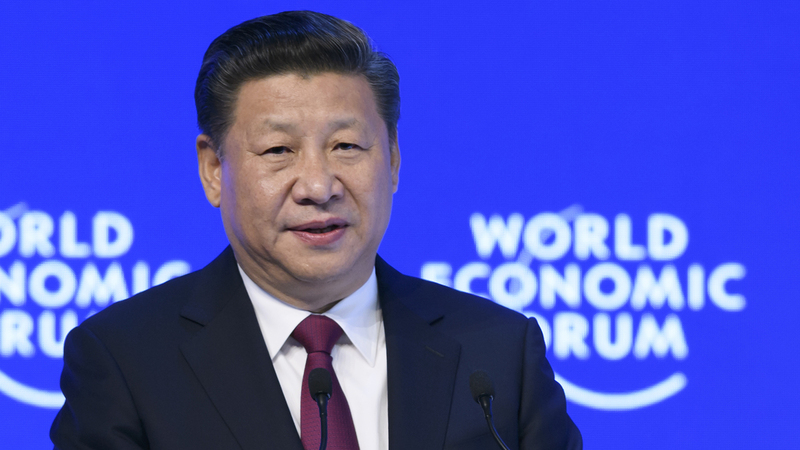 China's President Xi Jinping delivers a speech at the World Economic Forum on Tuesday in Davos, Switzerland. The global elite have begun a week of earnest debate and Alpine partying in the Swiss ski resort, in a week bookended by two presidential speeches of historic import — Xi's remarks and U.S. President-elect Donald Trump's inaugural address. In a major speech at the World Economic Forum in Davos, Switzerland, Chinese President Xi Jinping positioned himself as a defender of globalization and free trade. It was the first time a Chinese head of state has appeared at the annual meeting of political and financial powerhouses, and the speech was one that would have been "unthinkable" from former Chinese leaders, The Guardian reports. U.S. President-elect Donald Trump, days away from his inauguration, was not in attendance at Davos, and Xi never uttered his name. But many of the Chinese president's statements were clearly responding to rhetoric from Trump and his supporters, who have sharply rejected globalization and many existing trade deals. "No one will emerge as a winner in a trade war," Xi said at Davos, according to a Reuters translation. He compared protectionism to "locking oneself in a dark room," keeping out "light and air" as well as any potential dangers. Xi said there's "no point" in blaming economic globalization for the world's problems, many of which have nothing to do with global trade, The Telegraph reports. And even though some problems are linked to globalization, that's "no justification to write it off altogether," the Chinese president said. He called for countries to maintain their commitments under the Paris climate accord; Trump, during his campaign, promised that the U.S. would drop out of the pact. Overall, the speech "underscored Beijing's desire to play a greater global role as the United States turns inward," Reuters writes. Other observers drew the same conclusion. Ambrose Evans-Pritchard of the Telegraph said Xi was "throwing down the gauntlet" as Trump's inauguration approaches. One expert told The Washington Post this could be seen as a turning point where China moved toward filling a "global leadership role" that the U.S. has played for a century and now might be abandoning. While the speech was well-received by the crowd at Davos, according to The Guardian, there's also a healthy dose of skepticism about China's actual commitment to global free trade — let alone concerns over human rights or censorship. In The Wall Street Journal, before Xi's speech, Andrew Browne anticipated that Xi would present himself as "globalization's great defender." But he wrote that Xi's vision of globalization is different than the cosmopolitan vision of many Davos attendees. Xi values national, race-based identity over multiculturalism, and "insists on absolute state sovereignty," Browne writes. Browne argues that Xi's plan to invest in global trade infrastructure is intended not "so much to collapse national boundaries as to pull neighboring countries into China's geopolitical orbit." In Fortune, Scott Cendrowski described Xi as idealizing "a troubled China," noting that while he presented China as being open for global trade, businesses that work in China express concerns over "unfair regulations, unclear laws and Chinese protectionism."